We live in strange times, when most of the population is infected with Candida Fungi, and conventional medical doctors do not want to take note of this fact. They diagnose diseases caused by fungi as bacterial infections and treat them with antibiotics, which causes the fungi infection to spread further in the body. As a result, many patients fall into a vicious cycle from which they cannot find a way out. Based on experience from several years of medical practice I have developed my own, unconventional way of treating diseases caused by Candida Fungi infections. This book is the only such publication in Poland, and probably also in the world in which so comprehensively I presented causes, symptoms, and – most importantly – ways to treat diseases caused by Candida fungi, using methods of integrated medicine. Can Candida Fungal infection be cured? Inspirational book that will improve your health. The book contains a lot of reliable information about the functioning of the body. The author describes how to live a healthy lifestyle, which is basically by implementing a proper healthy diet and permanently changing one’s eating habits. He also points out that the need to effectively prevent diseases is much more important than treating them. I apply in my daily life the recommendations described in this book and I must say that there is a significant improvement in my well-being, my resistance to common colds and flu as well as in my general health. The book is easy to read and it took me just a few days to read it with pleasure and interest. It is a valuable compendium of medical knowledge, and medical issues are very well explained . I recommend this book to all those who want to improve their health and keep it at a high level. This book saved my life, and there is not a tint of exaggeration in this statement. I wholeheartedly recommend this book to all the people who have health problems and also to those who are healthy and want to stay healthy. I also strongly believe that this book about Candida is a must for each and every medical professional who truly cares about their patients? health and well- being. I bow to the Author with great appreciation for bringing this knowledge to the world. This amazing yet accessibly written book by Doctor Andrzej Janus , opens our eyes to the phenomenon ignored by most conventional doctors. Treated with antibiotics due to infection of individual organs and systems, we do not notice that all these diseases can have a single source: systemic Candida fungal infection. Meanwhile, our immunity decreases and as a result we become even more and more ill. I reached for this book with reservations, although I?d had it on the shelf for a long time. 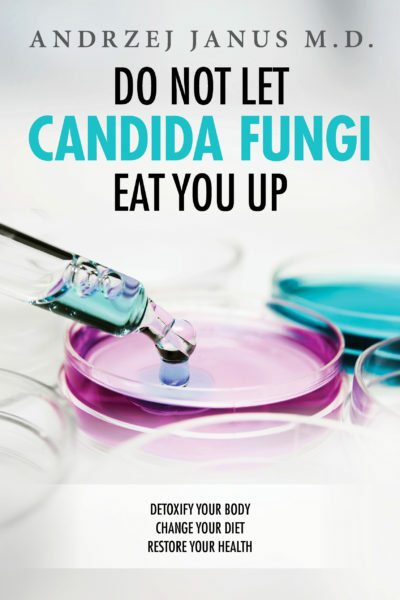 I swallowed it like a crime story, flushed with excitement and anticipation, and I started my private program “I won’t let Candida fungi eat me up” immediately. By performing easy tests proposed by Doctor Janus in the book, we can find out whether we are affected by Candida or not. I had no doubt at all. Nobody had ever diagnosed me better in my entire life. I bought herbal preparations, necessary for anti-parasitic and anti-fungal treatment, I completely gave up sugar, even fruit, white flour, alcohol and cow?s milk and its products. In less than a month I lost 10 kg, I feel great, I am healthy and I have energy, I sleep better, my skin looks better, and I myself look and feel 10 years younger. I am not depressed or fatigued any more, and I finally feel that I can learn new things. This is by far the most important book from the collection of the “books that have changed my life”, because it has brought me the most spectacular and the fastest positive change ever. I am grateful to the Doctor and to the Publisher for this book! I recommend it to everyone and I buy it for all the people I care about! I was born and raised in what we can call an older Poland, in times where Europe?s consumerism was much lower than it is today. I?ve always tried to live with actions and words that are substantial to me, but how little did I know at the time. The North American fast life and little information on nutrition have only encouraged the decaying of my body, mind and soul. After reading and researching for 1.5 years to better my health, I?ve stumbled upon a mountain of audio-visual information presented all by reputable professors and doctors. My knowledge has grown and today I respect and adore the book I?ve read on the Candida fungus. My spirits were broken when I realized how bad my lifestyle had become and how it had affected my organism. I was very close to being consumed by an aggressive laryngal cancer and I suggest everyone to follow this book, as it saved my life and it can save others as well. I?ve seen my life change for the better by trusting in this book and I pray it serves those who need it most. I wish every day that my mother knew all this information and that she provided a smarter and better nutrition to me and my family. I would have been a different person today, as we are always one step away from a different life. I?d like to thank Dr. Andrzej Janus for such important wisdom and life-changing piece of advice – a real gem! Ewelina – Montreal, Canada, 2018 r.
After reading this book Candida , You will never feel like putting another granule of sugar in your mouth ever again. Book gives you the knowledge and motivation to make the idea of giving up sugar seem more like a blessing instead of a deprivation or punishment. I read did book and started diet immediately, Im. at the beginning and I already feel amazing. I haven?t feel this good since I was a kid ! Thank You Doctor Andrzej Janus for giving me a chance to know what is important in live . It is a great book and gives you great insight info about medical problems witch are not discussed in the doctors offices or media. Be alert and get it fast .